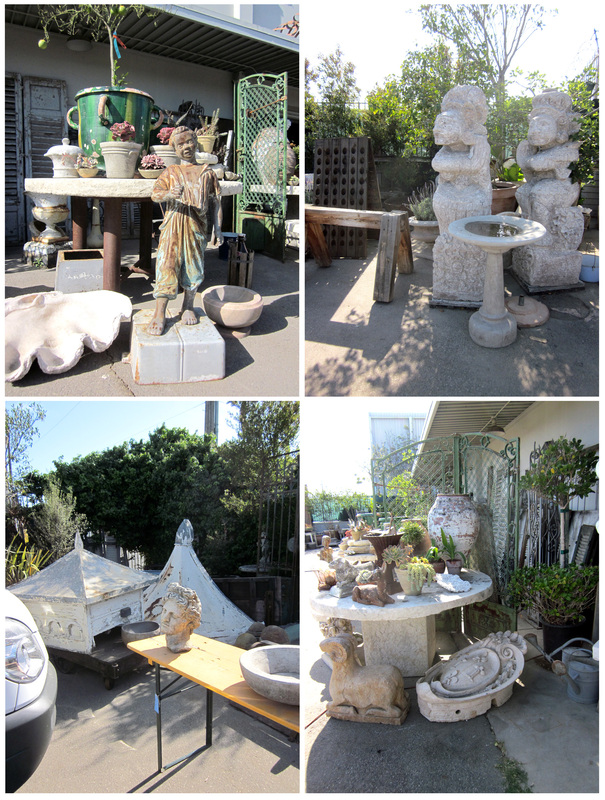 … architectural bits and bobs, and awesome statuary! In search of a suitable container for that huge aloe tree? 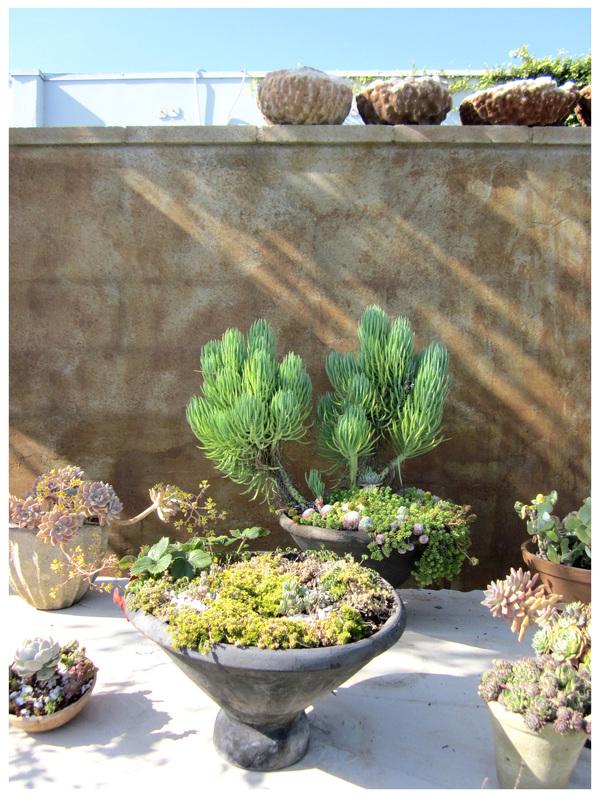 How about a man-sized terra cotta flowerpot? 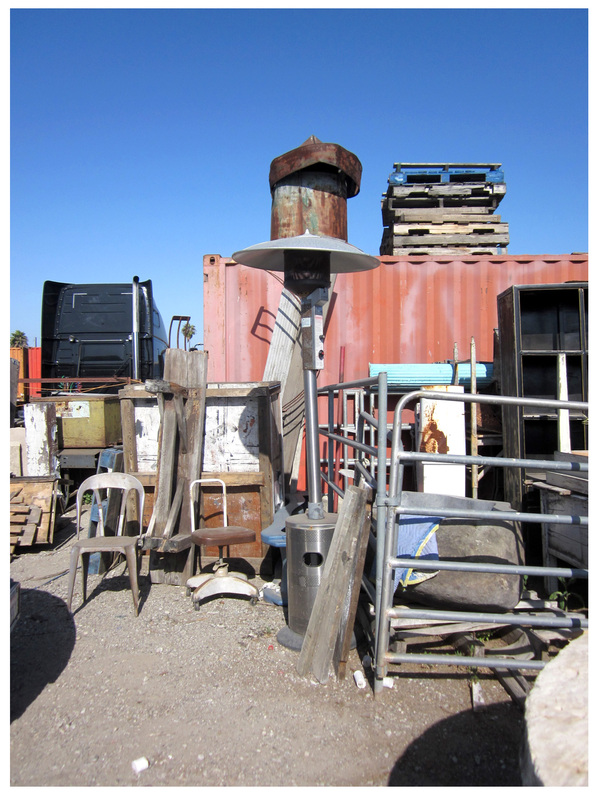 Or, an enormous painted-and-rusty metal urn? Maybe a ruggedly-pocked stone pot? Whichever, BD’s got it. 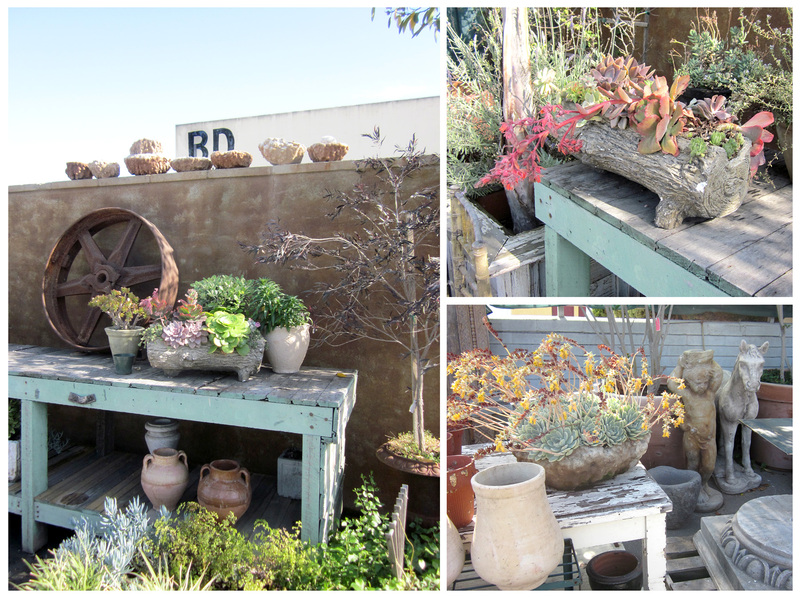 There are also moss-flecked troughs, carved stone vases and faux-bois logs; all would complement succulent insiders. 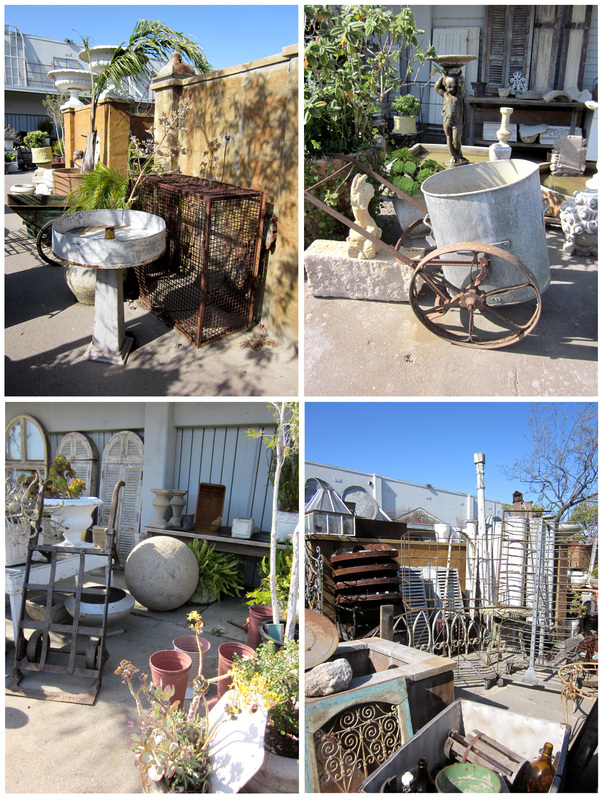 Oh, and note that enormous metal basket being used as a hose holder in the top left picture. I asked for a price check on it and the $600 price didn’t seem that bad: it’s huge, after all! Visually, there’s something about the lusciousness of juicy leaf succulents paired with distressed containers that is so appealing. BD’s features several vignettes that display this effect quite pleasingly. Of course, the displays with concrete faux boix examples really speak to me … parlez vous debit card? Hard-working industrial items, most of them metal and rusted, hold a special place in my design pantheon and BD’s has a lot to love. 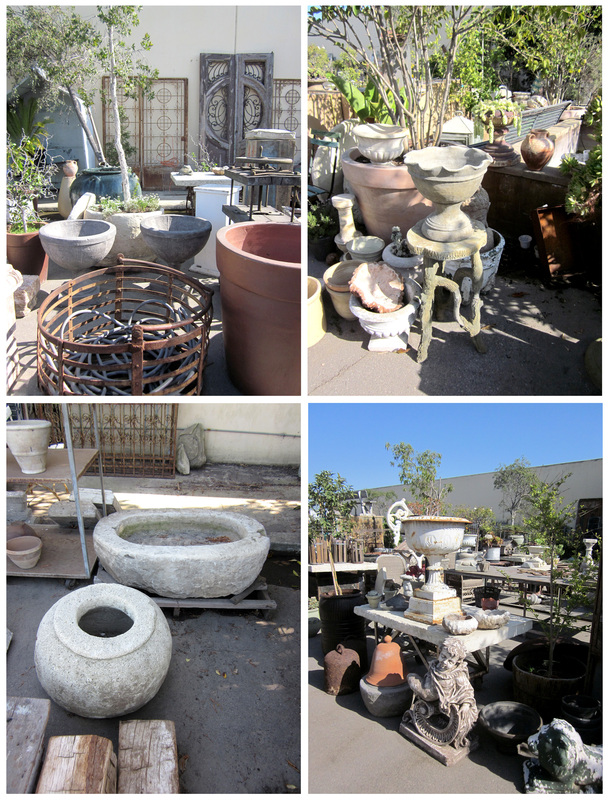 Everything from French trollies, to factory grates and smelting pots can be found here. Metal gabions, gates and grills, and all manner of bucket, would look great in a garden setting as accent or focal point. 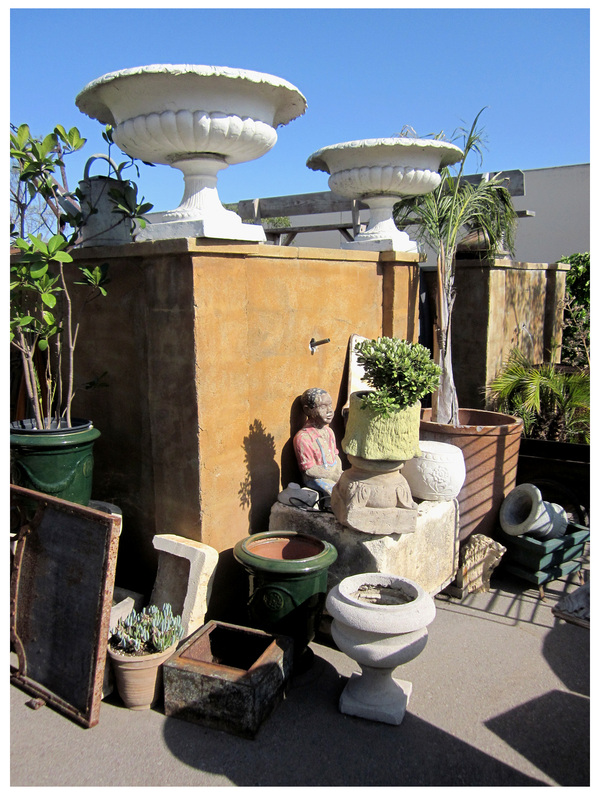 Crumbling cornices and other architectural fragments are available at BD’s, as is a diverse array of statuary. 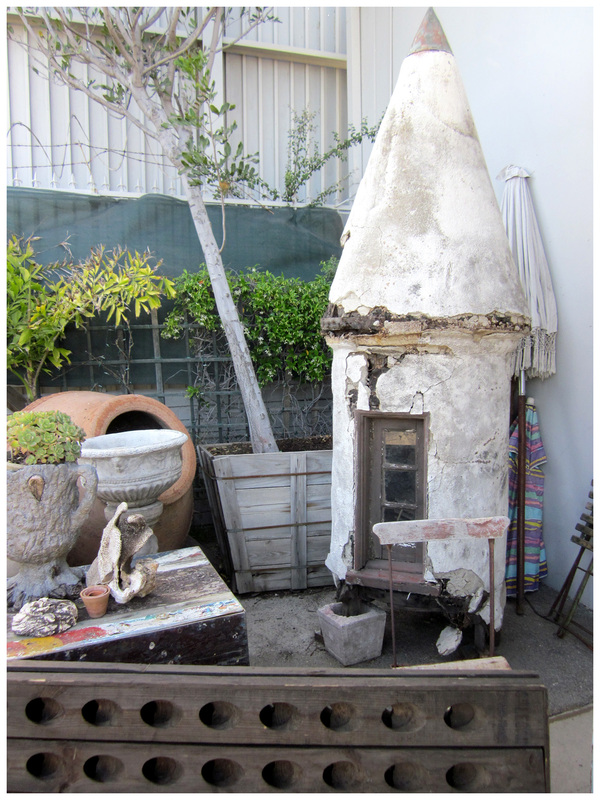 People your garden with a cast iron attendant, a pair of huge Balinese stone deities, or the yearning head of a Greek demi-god; or, set out to pasture concrete sheep or other vintage livestock, and you’ll never have to see your accessories in anyone else’s backyard. OOAK is a BD’s given. You’re probably wondering what I bought at BD’s; you’ll be amazed to know I came away empty-handed. See, it took us longer to get there than expected, so we got there alarmingly close to their shuttering for the Easter holiday weekend, leaving me with just enough time to take the pictures for this and the upcoming post. **Sigh** But it’s okay because it just means we’ll have to go back again … giving me enough time to save up my mad money for a special piece. The question is: will it be something for inside, or outside, the Rancho? As you’ll see in the next post, BD’s takes the same themes they feature in outside decor, inside. Third picture, metal chair on the left — kinda looks like a “submarine” chair. Out of all that amazing stuff, that little chair sets my heart atwitter. There’s a salvage/antique store not far from the Metro Blue Line stop on Grand, and at first I thought this was the same place — but it’s not. BD is actually pretty close to me! What a find. The stuff inside is next, prepare for defibrillation, Denise!